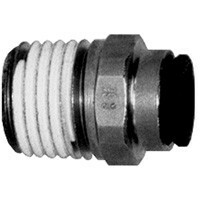 # DIX31755314 - Male Connector (Tube to Male NPT) - Tube O.D. : 1/8 in. - Male NPT: 1/4 in. Quick Connect and Disconnect: Simply push tubing in. To remove, press the release ring towards the fitting and pull tubing out. No tools required. Materials: Nickel-plated Brass Construction. Black body is Glass-filled Nylon; Buna-N O-Ring seal; Polypropylene release button. Silicone free. Positive Seal: Sealing and holding is accomplished instantaneously. Reusable: Connect and disconnect numerous times. Full Flow: Fitting seals on outside diameter of tubing. Working Pressure: Fittings rated to 275 PSI at ambient temperature. Maximum Working Temperature: 175 degrees F. Pre-applied thread sealant on all male pipe threads. Compatible Tubing: Semi-rigid Nylon, Polyurethane and Polyethylene tube.